At least two Democrats in the Arizona legislature are pushing back on a potential November ballot initiative that would require 50 percent of the state's energy production come from renewable sources by 2030. State Sen. Robert Meza and State Rep. César Chávez, both from Phoenix, launched a detailed criticism of the renewable energy push in an editorial on Tuesday. The effort is being funded and promoted by California billionaire and political activist Tom Steyer. "This proposal is being forced on our voters by a California billionaire," the pair wrote. "He and his political strategists have created this initiative as a mirror image of a regulation already adopted in their home state. But we don't believe a California plan is necessarily the right fit for Arizona." "Arizonans should be careful. If voters approve this initiative, it will be locked into the Arizona Constitution and virtually impossible for policymakers to make corrections or account for changes in technology or the marketplace," they concluded. The pair of lawmakers also cited concerns about costs they claim would be passed on to ratepayers, and expressed concern of how those costs would be born by lower-income residents. "We're especially concerned about the working class and largely Latino neighborhoods we represent across south Phoenix and the West Valley. Low-and fixed-income families are struggling as it is," Meza and Chávez wrote. "How unfair it would be for the rest of us to heap new charges onto their electric bills, forcing seniors and other vulnerable residents to make painful choices between cooling their homes in the summer and other basic necessities?" One week ago, it was Republicans who took aim at the possible ballot measure, giving their go-ahead in a committee vote for a bill that critics claim would make the mandate toothless by stripping away enforcement mechanisms against energy companies. Representatives from Clean Energy for a Healthy Arizona, the group formally behind the initiative but backed by Steyer, could not be reached. Steyer's main political agent, NextGen America, did not respond to a request for comment. 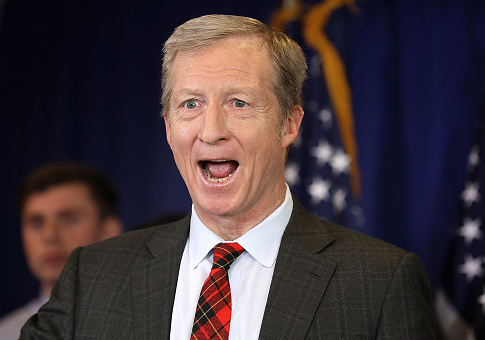 While Steyer has become better known nationally in recent months because of his "Need to Impeach" television ad campaign, he has promoted similar kinds of renewable standard initiatives and legislation in the past in other states. A former Republican legislator cowrote an op-ed praising the proposed 50 percent standard on Sunday. "In addition to improving community health, moving to renewable energy will save money for Arizona residents and businesses," wrote Sue Gerard, a former Republican state legislator and former director of the Arizona Department of Health Services. In order for the question to be placed before Arizona voters, Clean Energy for a Healthy Arizona will need to submit roughly 226,000 valid signatures by July 5. Update March 22, 12:34 p.m.: A previous version of this piece misidentified Sue Gerard as the current director of the Arizona Department of Health Services. She is the former director and is not currently employed by the agency. This entry was posted in Politics and tagged Arizona, Tom Steyer. Bookmark the permalink.